After my various seafood binges for the coming festival, I was craving for something simple and comforting. One of my favorite comfort food is a simple dish of Yong Tau Foo (YTF) or stuffed beancurd and veggies. My family loves this dish and we have tried many places that sell this speciality. One of our all time favorite YTF place is located in Menjalara, Kepong called Chan Chan YTF. This is a family run business that serves a no frill but genuine homemade goodness YTF. 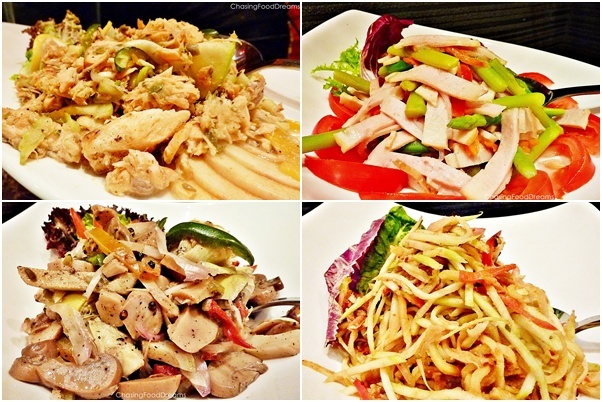 We have been to Chan Chan many times and one thing is for sure, their quality is very well maintained each time. We can count on Chan Chan to serve piping hot and fresh fish paste stuffed into big cuts of taufoo and veggies. Besides serving YTF, they also serve some of their specialty dishes like Vinegared Pork Trotter, Grape Wine Ginger Chicken, Asam Fish, Sour Asam Vegetables, Hakka Braised Pork with Black Fungus and a few more items. First up was the YTF in soup with smooth white bean curd, bittergourd, lady fingers, fish paste and chilies. That innocent chili really packed a punch. One bite and the mouth went numb with spiciness! I love their beancurd, smooth and soft, I feel very content with just having this alone. The owner also added plenty of "shui chai" vegetables in the soup which tasted of anchovies. Check out the huge piece of fish paste. We also ordered some fried "fu chuk", fried dumplings and eggplant. Super crispy and hot, one bite will get you hooked! Grape Wine Chicken was next. I am not a fan of this dish as some places makes it too sweet. This one had me gulping down the soup continuously till I was blushing due to the strong alcohol...hehehe. Full of herbal essence and a well balanced grape wine, the broth is just simply beautiful and luscious. Chicken was average but it was the soup, shredded black fungus and ginger that got me drugged! Asam Vegetables or "Suen Choy" is another must have here. Braised salted vegetable with asam pieces and chilies, this dish is another favorite of ours. The vegetable has been braised till soft and the sourness with spiciness is just perfect for my family's taste buds. Vinegared Pork Trotters is another indulgence! Braised till the meat is tender but still with a bite, the balance of black vinegar was faultless. Sour and sweet, we just cannot stop drinking up the soup although it was a bit oily. YTF priced at RM1 each piece. Verdict is that this place is really value for $$ as the pieces of YTF is big and well stuffed with bouncy fish paste. Other dishes are really good as well. Quality is well maintained over the many visits to this place. If you are looking for comfort and homemade goodness, Chan Chan YTF is definitely highly recommended. Be prepared to wait as YTF is made to order. Disclaimer: The opinions and experiences articulated on this blog is entirely based on my personal taste buds and may be at odds for other foodies. Some of us bloggers decided to get together to celebrate the end of a wonderful Tiger year and the beginning of another fantastic year of the Rabbit to come! 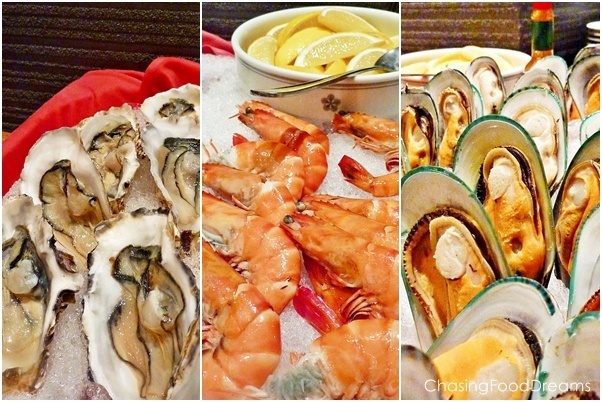 We met up at Flavors Restaurant in Swiss Garden Hotel & Residences in downtown KL to stuff ourselves silly with their Chinese New Year Buffet Dinner. Since there were so many of us, buffet was the way to go as this will surely hit the spot for everyone. In addition, variety is the spice of life! 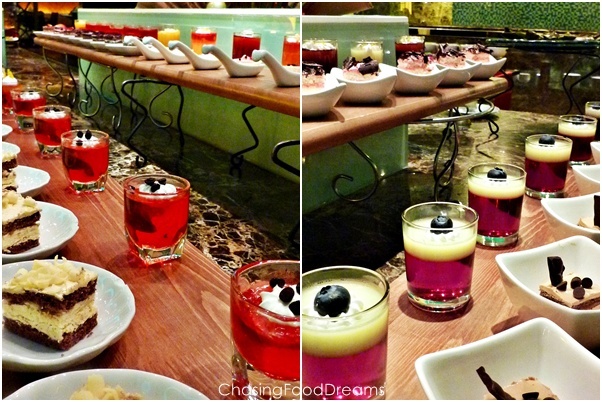 Flavors is located on the first floor of the hotel and features a unique and charming concept of chic dining. The restaurant was design with contemporary settings intended for comfortness and yet chic for entertainment to last through a timeless era. Love the idea of a Yee Sang Bar! Check out the traditional Yee Sang with its fruity sauce. Chopstick full of flavors.. "lou hei, lou hei!" There were also two soups of the day...Chicken Soup and Hot and Sour Szechuan Soup with bread rolls. My favorite of the night...Beef Rendang...tender and so flavorful! Spicy and aromatic Garlic Chili Prawns...lovely and yummy! Fried Rice with Abalone Sauce...surprisingly delicious! There is also a Fishball Noodle Soup station and Cantonese style Noodle station. Deep Fried Special New Year Cake (Nian Gao)...oh boy oh boy, this is really outstanding! Pieces of Nian Gao, Pumpkin, Yam, all bundled tightly with Seaweed and coated in a super crispy beautiful batter! There was also a warm and fluffy Bread Pudding, Sweet Tong Shui, Platters of Fruits and ice cream. We really enjoyed ourselves to the fullest with good food, great friends and beautiful environment. Head on over to Flavors to experience this yourselves! Available from 17th Jan to 13th Feb.
Takeway is available only after 12 noon onwards. Disclaimer: The opinions and experiences articulated on this blog is entirely based on my personal tastebuds and may be at odds for other foodies. With the coming Chinese New Year holidays, most hotels and restaurants are preparing for the festive holidays with special menus. Lucky me! My friend, Sid from BigBoysOven extended an invitation from Prince Hotel to review their festive menu at their Cantonese restaurant Tai Zi Heen recently. Prince Hotel is a class of its own with its beautiful décor and gorgeous art collections. The lobby has a stunning modern art chandelier that took my breath away. There are also gorgeous vases and beautiful artifacts surrounding the whole hotel. Tai Zi Heen’s award winning Chinese Master Chef Ricky Thein, and his culinary team delivers authentic Cantonese food into the realm of contemporary cuisine with dishes that accentuate original flavours with a modern twist! The décor of the restaurant is an ideal venue for work and personal functions and has a seating capacity of 180 persons with five private dining rooms for special occasions. Dressed with red lanterns, the chandelier was simply D.A.Z.Z.L.I.N.G! There were two gorgeous huge enameled vases that stood outside of the restaurant’s main entrance! Restaurant’s entrance which features two beautiful embroidered chairs covered in red & gold fit for royalty. Tai Zi Heen’s culinary team has come up with a magnificent list of CNY set meals and ala carte dishes to jazz up the festival. We started off with the must-have traditional Yee Sang with Salmon. Chef Thien really kept the Yee Sang light, simple and delicious! Fresh golden salmon slices, finely julienne vegetables, crunchy jelly fish and crackers were unified by a beautiful plum sauce with lemon that was very well balanced. I just cannot resist a plate of heavenly salmon slices that is so fresh, one can see the sheen of freshness on the fish. I cannot stress how important a blissful soup can make a difference in a meal. We were served the Double-boiled Pearl Shark’s Fin with Bamboo Pith and Chinese Cabbage. I must have done something right in my past life…to enjoy a luxurious Braised Dried Oysters with Fatt Choy, Baby Abalone, Sea Cucumber and Wok fried Greens. My portion of Food of the Gods! Traditional style Steamed Cod Fish was served as our fish course. This must have been a huge cod because the size of the slices was really humongous. With a prosperous meal, comes with a prosperous dish of “Har”, Stir-fried Prawns with Pumpkin Sauce served on a Rice Nest. The restaurant spares no expense at serving fresh huge prawns, coated with a golden pumpkin sauce, nestled comfortably on a rice nest. Prawns were crunchy and very succulent, bathed in a lightly sweet and savory sauce of mashed pumpkins. Another award winning dish in my opinion. After my seafood ecstasy, dessert of Double-boiled Hasma with Red Dates and Glutinous Rice Dumplings were served individually. I am not a fan of Hasma (which originates from frog) which has a tendency to be fishy. Although there are reported benefits of this delicacy replenishing the lungs, kidneys and improving skin completion, I have had a few bad experiences with this dessert. The one served at Tai Zi Heen has absolutely no smell, hence I was happy to devour this with delight. The glutinous rice dumpling was smooth and silky with a stuffing of black sesame paste. My seafood rendezvous ended with a sigh of great satisfaction from everyone at our table. No wonder Chef Thein has won many awards for his Cantonese cuisine. All of his dishes were clean and very well balanced in flavours. This is definitely Cantonese cuisine at its best. My conclusion is that Tai Zi Heen is well worth the price and the drive (to beat the horrendous traffic) to savor its Cantonese cuisine with a modern twist. Salute to Chef Thein! Jalan Conlay, 50450 Kuala Lumpur. Silver Spoon Trattoria.. Back Again!